Let me put this right out there: I’m not a big gamer. Sure, some 20-plus years ago I blew some money on Nintendo game cartridges and played hours of Super Mario Bros. with the best of them. Today, there’s an Xbox 360 console at home, but it’s not mine, and my idea of a good game is something I can play on the iPhone before falling asleep at night. 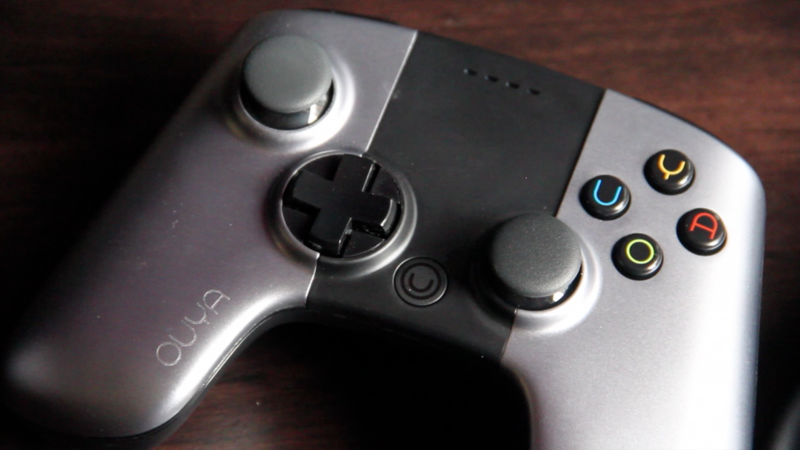 Could the compact, indie-focused Ouya turn out to be the gadget that gets me back into console gaming? A new-to-market, $100 console system that’s taking aim at the “big three” — Nintendo, Microsoft and Sony — Ouya blends aspects of console gaming with mobile game features. 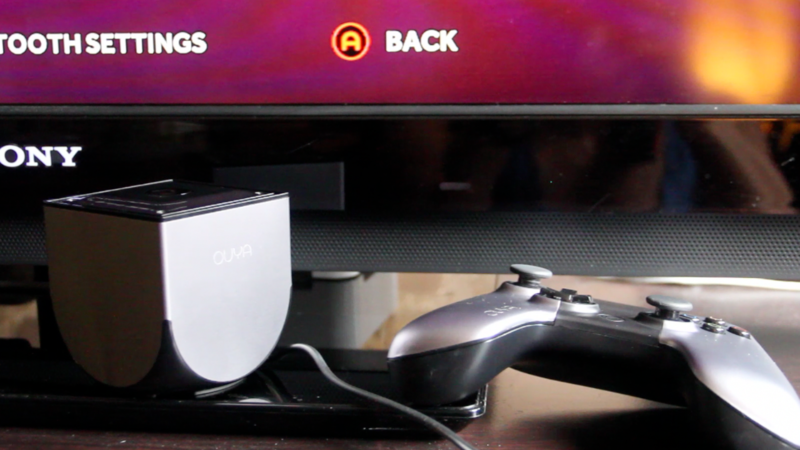 The Ouya console — which is named for the sound gamers make when they’re feeling triumphant (oooh-yah!) — is pint-sized, and comes with a single, standard-size wireless gaming controller. 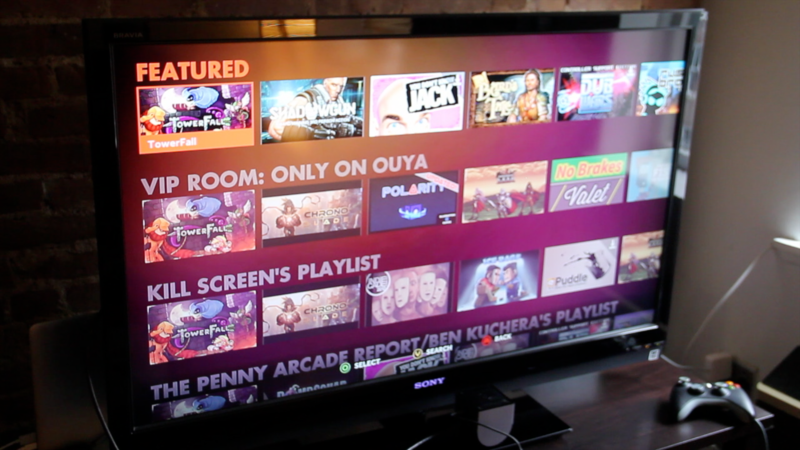 It runs on Google’s Android operating system, but there’s not a hint of Android anywhere in the Ouya interface. Instead, Ouya has its own online videogame store. The store is stocked mostly with games from independent developers, and they’re all free to try, with options to upgrade for more content. The games I ended up purchasing ranged from $2.99 to $4.99 per game — the same kind of prices you’d pay for mobile apps. I’ve been playing with the Ouya for the past week. It was definitely not without its glitches — for example, I couldn’t get a non-Ouya controller to work with the system as promised — but overall I had a good experience. However, I’m doubtful that this is going to replace any of the major consoles anytime soon, for two reasons: First, a lot of core gamers love their graphics-heavy franchise games — Halo, Call of Duty, Battlefield, etc. — and Ouya currently doesn’t support such games. Second, many console owners also use the Wii, the PS3 or the Xbox to stream media from apps like Netflix, Hulu Plus and Pandora. I’m one such consumer. And Ouya currently doesn’t offer these media-streaming options (though it does offer the gamer-centric Twitch.tv app). It’s also worth noting that Ouya isn’t the only Android-based, videogaming gig in town. The U.K.-based PlayJam company is putting out an Android “console” in the form of a USB plug-in stick, called GameStick, that works with a wireless controller. Green Throttle is an Android-based platform that runs on your tablet or smartphone, patching games through to your TV screen; it also works with a controller. Until Ouya offers more both in terms in game and media, I think it will be a supplemental device for people who already own consoles. Or it may be a relatively inexpensive, cool-looking console for those who are really into in indie games. But it’s not your be-all console. Compared with the long, heavy-textbook bulk of consoles that still run game discs, Ouya is compact and cube-shaped, and weighs just 10.5 ounces. It has an Nvidia Tegra 3 processor, one gigabyte of RAM and 8GB of flash storage. The console is made of sand-blasted aluminum and sturdy plastic, which, when it’s not on, is cool to the touch. After an hour or so of game playing, it heats up. But, unlike game consoles (or NAS devices) that sit near your TV and whirr all day or make blustery sounds when taxed, the Ouya is wonderfully unobtrusive and quiet. The controller is less wonderful. It looks nearly identical to an Xbox controller, but more angular — and it feels cheaper. And while Ouya’s makers like to point out that the center section of the controller acts as a touchpad, I never felt the need to use this option. Setting up the Ouya and connecting it to my home Wi-Fi network was simple, as was pairing the controller via Bluetooth. 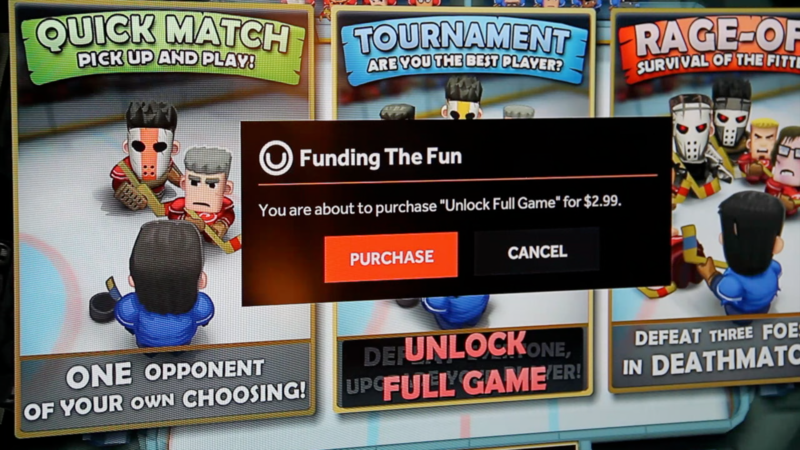 Ouya requires all registered users to enter their credit card information at sign-up, which was slightly more involved. On to the main event: The games. 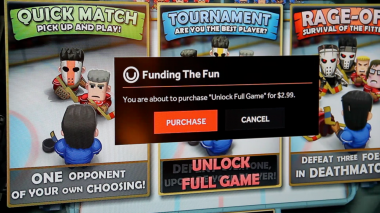 Ouya has about 200 games in its store, and these are specific to Ouya — so, even though it’s running on Android, you can’t just download and play any Android game. About a quarter of these games are exclusive to Ouya. The games are categorized for easy discovery into verticals like Featured, Trending, Genres and Showcase: Couch Gaming With Friends. There are also playlists put together by reputable gaming outlets like Penny Arcade and Kill Screen. And there’s a search function if you’re looking for a particular title. You might recognize titles like Final Fantasy III from Square Enix, or You Don’t Know Jack. Otherwise, these titles are lesser-knowns from small developers, falling somewhere in between your massive multiplayer games and your casual mobile games. Sega’s Sonic the Hedgehog was supposed to be on Ouya at launch, but mysteriously wasn’t in the store. Some games are free; others offer free trials and then require you to upgrade to a full game. I played more than half a dozen, including Final Fantasy III, ChronoBlade (third-person fighting game), Ice Rage (cartoonish air hockey), BombSquad (a party game that uses bombs to attack opponents), Canabalt HD (a parkour game), Vector (another parkour game) and Puddle THD (in which you push a gelatinous puddle of liquid through mazes). Some games felt modern and fresh. Others had a retro 8-bit feel. Some eluded me. Others I picked up right away. Such is the gaming life. I played five nights out of the past seven. Then the novelty sort of wore off. The games were okay, but not fantastic. Only two that I played, BombSquad and Canabalt HD, were compelling enough for me to pay to upgrade, for $4.99 and $2.99, respectively. In fact, BombSquad was my favorite game of all the Ouya games. It was hilarious. I sailed through the first 10 questions of You Don’t Know Jack, but declined to upgrade the quiz game for $9.99. 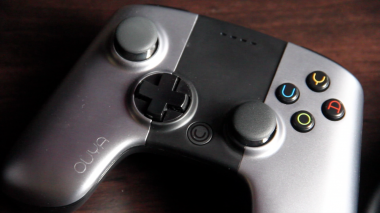 In my experience, the Xbox 360 controller wouldn’t pair up with Ouya — and I tried both a wired and wireless connection. I didn’t have a PS3 controller to test, but I do know that the PS3 controller requires an adapter to work with Ouya. So, long story short, without spending an additional $50 on another Ouya controller, I couldn’t really get into party-game mode. There are some games — including BombSquad — that have iOS or Android apps that turn your smartphone into a remote. I tried this, but felt limited without the controller’s bumpers. And for some reason, Ouya at first wouldn’t process my payments for the games. The company suggested that I reboot the console. Once I did that, my payments went through. 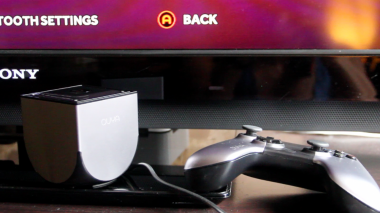 I had high hopes for Ouya, and I had some fun with it. 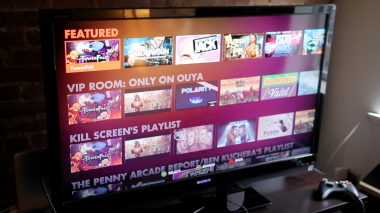 Indie game fans might really enjoy it, and Ouya has plans to expand its content offerings. But right now I can’t see it having broad appeal.